what about the plastic animals? I have returned from San Francisco. It was a good trip. A little vacation, a little work, and a bit more vacation. Two exciting baseball games were seen. Caught up with old friends. A couple of burritos were eaten. The Cherry Blossom Festival Parade was attended. And many miles were walked. A visit to the museum. Tasty Donner Dog for lunch. Up close there are two faces, from across the room it looks like a wolf. 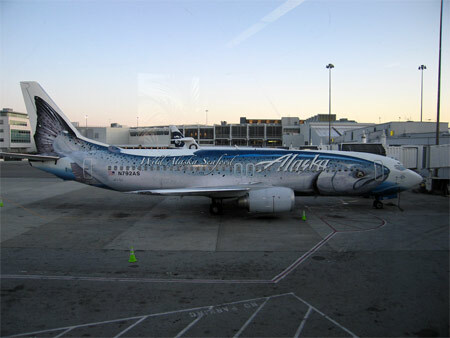 The last day in Anchorage wasn't too exciting. I was tired and got a slow start on the day. I perked up with hot chocolate and pastries at Tidal Wave Books. 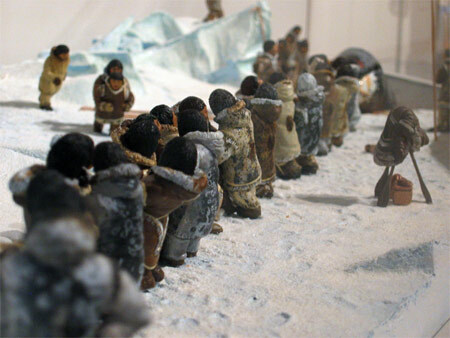 Finally awake I toured the Anchorage Museum of History and Art which has an extensive collection on Alaska history that I really enjoyed. It probably would've made more sense had I gone through the exhibit before seeing the rest of the state, but it made for an excellent summary. 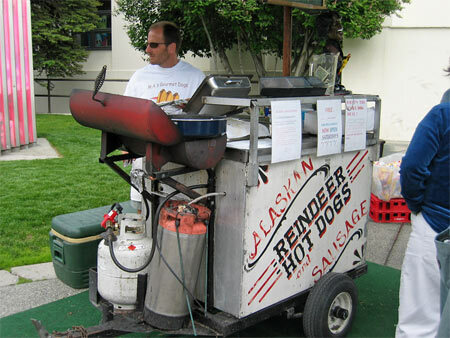 After the museum I parked downtown and hit all the tourist shops, wrote a bunch of post cards, had a reindeer dog, wandered through the Alaska Public Lands Information Center (also would've been useful before touring the state). Fully informed about what Alaska has to offer I walked aimlessly around downtown Anchorage before getting in the car and driving aimlessly around town. I wound up parking near the airport and walking the Tony Knowles Coastal Trail near Point Woronzof. 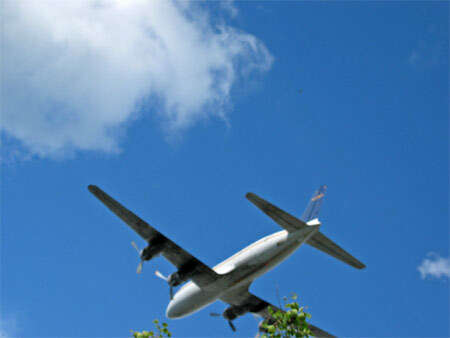 The airport runway runs right up next to the trail so I had a great view of planes landing and taking off. 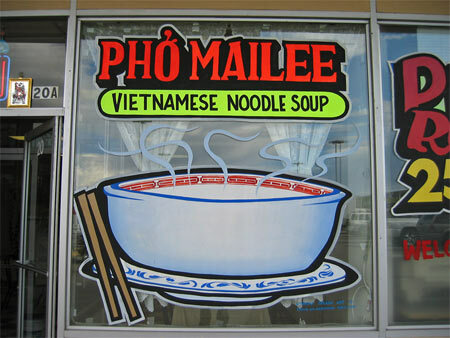 It took a while to find the place, but I eventually located the Vietnamese restaurant I ate at on my previous visit. A big bowl of pho and I was ready to leave. That's it! 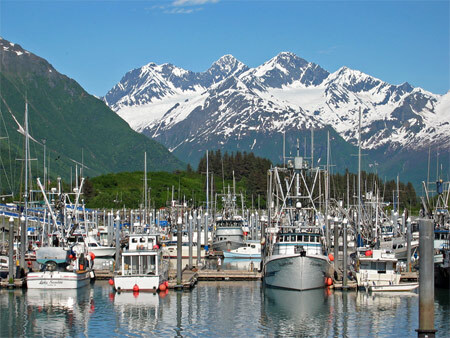 I had a great time in Alaska and would encourage everyone to spend a couple of weeks there if you can. 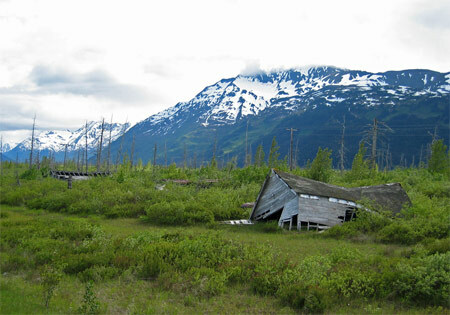 If you drive along the Seward Highway it is imperative that you take a picture of the house and trees damaged in the 1964 earthquake. Unrelated but odd: I ran into someone on the street yesterday that I hadn't seen in months. She waved. I waved. I slowed down. She said "Hey, Joe, I haven't seen you in ages." and kept walking. 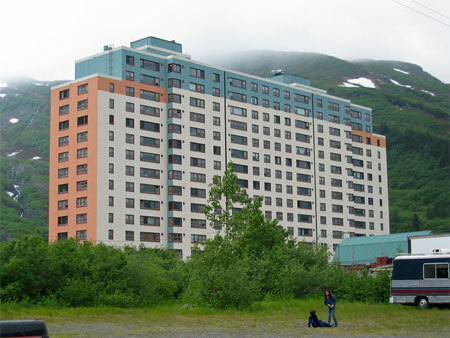 A couple of hundred people live in Whittier. All in this building, which also houses the post office, city government offices, a restaurant and small grocery store. He was just sitting there watching the enormous bonfire. Anton Anderson Memorial Tunnel. The only way out. Whitter is unique. 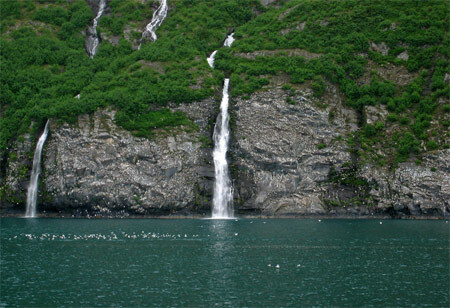 It was founded during World War II by the Army because the port was ice-free and relatively close to the Alaska Railroad. Relatively close once they drilled a 2.5 mile tunnel through a mountain. Until recently, the tunnel was the longest highway tunnel in North America. Now it has to settle for being the longest combined rail-highway tunnel in North America. Sometime after the war the town outlived its military usefulness. People stayed on, however. 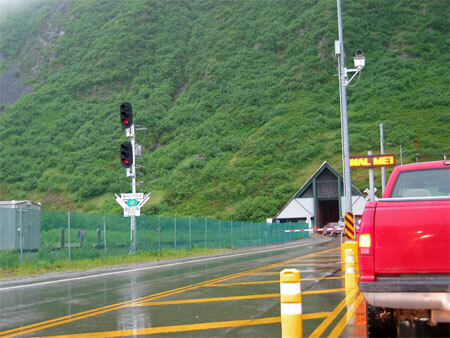 It wasn't until 2000 that the tunnel was improved so that it could hand vehicular traffic. There is still just one lane. Cars and trucks take turns going in each direction as do the trains. 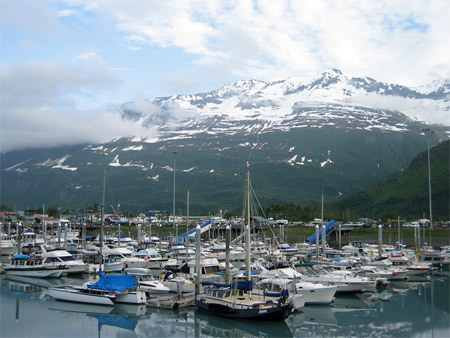 Cruise ships have recently started coming to Whittier, so small shops, much like those on the Homer Spit, have begun to open. I intended to walk around and take pictures after I got off the ferry but a) although small, Whittier isn't a very walking friendly sort of place and b) I was totally burnt out on the vacation. Speaking of Homer, the city has asked the state to install the city's first traffic light. Arrgh! I put this up as a draft and forgot to publish it. 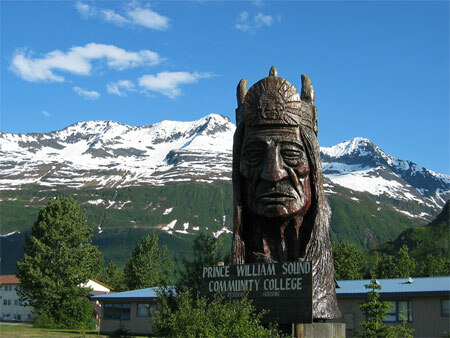 It obviously should go before the Across Prince William Sound entry. 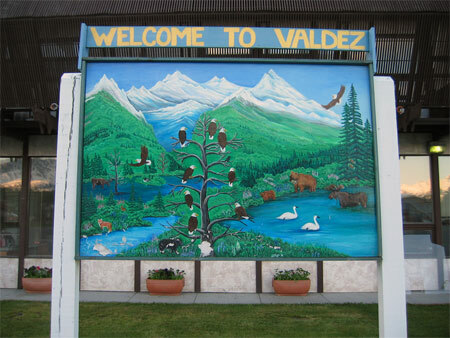 This picture doesn't have anything to do with saying good-bye to Valdez. I just like the photo. 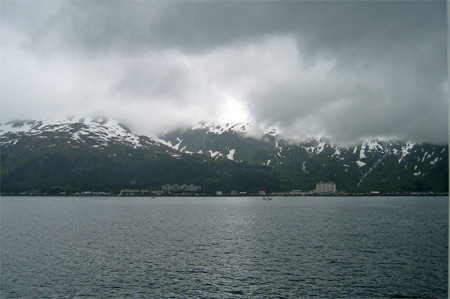 and sailed across Prince William Sound to what is arguably Alaska's strangest town. Oil taker with safety escorts. 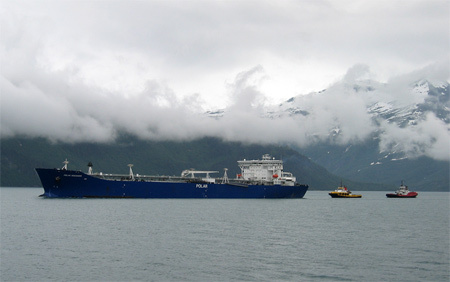 There were two National Park Service rangers on board. 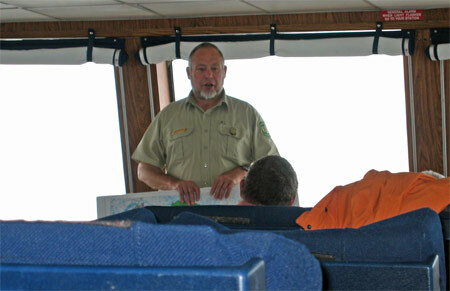 They described the different types of wildlife and the natural history of the sound. The white specks on the rocks are birds. 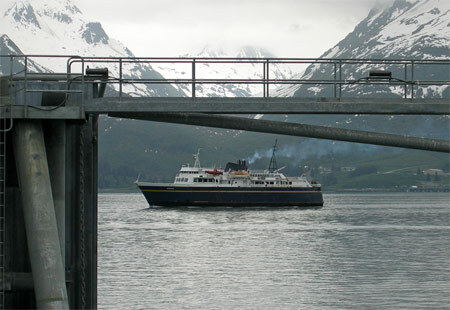 The ferry ride from Valdez to Whittier was much more tourist-oriented than the Homer-Kodiak run. 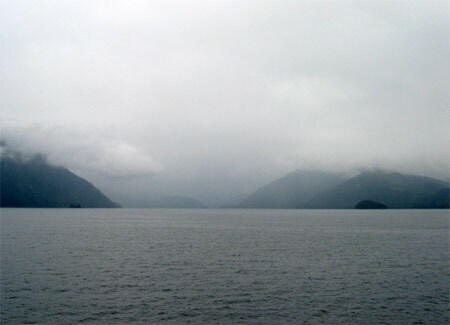 It was cloudy, foggy and rainy for most of the trip. I saw a few sea otters and lions and a couple of icebergs. All were too small or too far away to take a good picture. There may have been more sights, but in a sign that vacation fatigue was setting in, I fell asleep for most of the five hour trip. A bit out of order since I'm nearly done with Valdez. 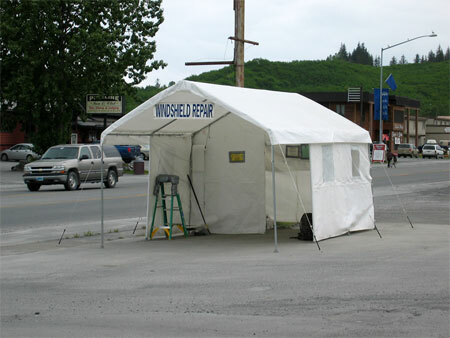 The windshield repair tent was a bit mysterious. I saw a guy in a cowboy hat walk there in the morning and walk home at night. In the nearly two days I was in town I didn't see any cars getting their windshields repaired. 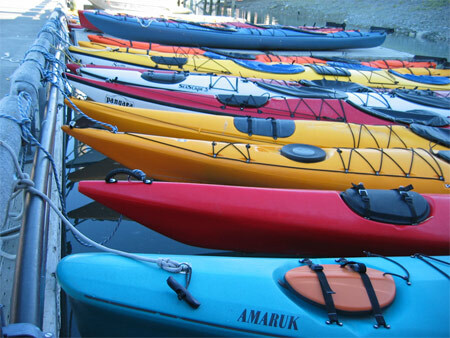 The kayak photo reminds me of a story that was in the Anchorage paper while I was in Alaska. A couple was in a kayaking accident. The guy made it to shore but his wife was nowhere to be found. A rescue squad was sent out and the next morning a policeman brought the husband down to the station. "I have bad news, good news, and great news" announced the policeman. "Let's get the worst over with first. What's the bad news?" The man asked. "We found your wife. She drowned." "Oh, no," cried the guy, "what's the good news?" The police officer explained, "When we brought her up there were two king crabs and 15 dungeness crabs attached to her." "Oh my God! What could possibly be the great news?" "Well, we're pulling her up again tomorrow!" 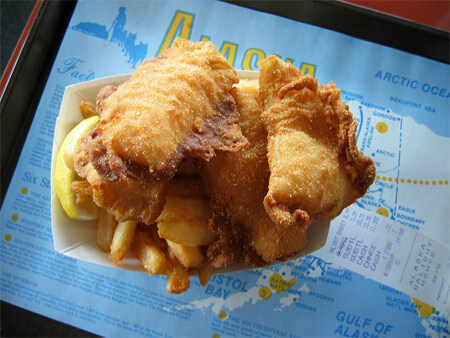 Halibut basket at the Halibut House. 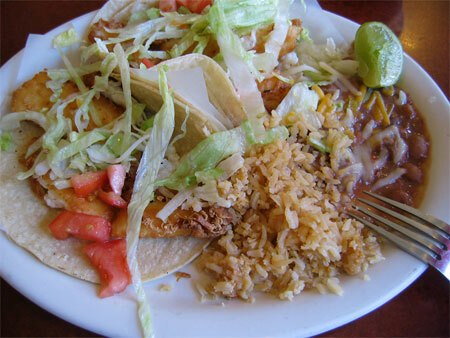 They weren't Baja fish tacos, but the halibut tacos at Ernesto's were great. From the oil derrick to your plate didn't seem too appetizing. The sign in the foreground cracked me up. 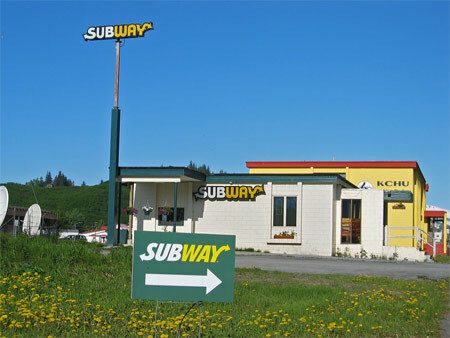 The sign is one of the tallest structures in Valdez and the Subway is on a block with two buildings. Frankly, the person who couldn't find it deserves to go hungry. 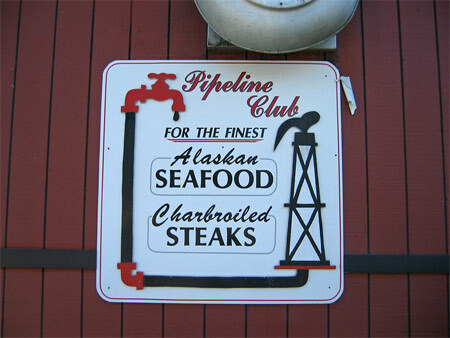 Maybe they needed the sign because it was the only chain restaurant in town. 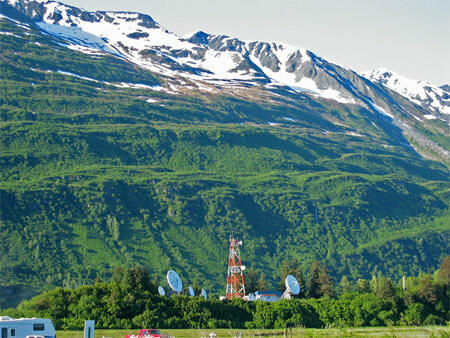 In some ways Valdez felt more isolated than Kodiak. No McDonalds, the Great Eagle supermarket hadn't yet been converted to a Safeway, Kodiak had a Wal-Mart, and the closest movie theater to Valdez was a 300 mile drive away in Anchorage. 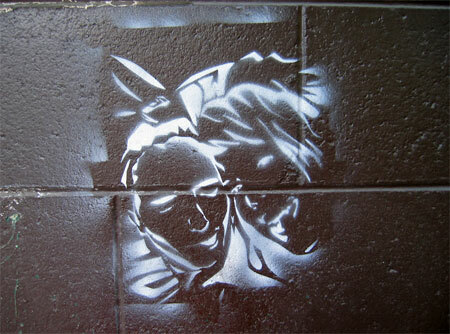 You may have noticed that some of the building photos, like the Subway picture above, are overexposed. I did my novice Photoshop best to darken them but it was really bright the Saturday of my stay in Valdez. If you've been reading along for a while you know I've had several surgeries to remove basal cell growths. I'm now very careful to avoid as much sun as I can. 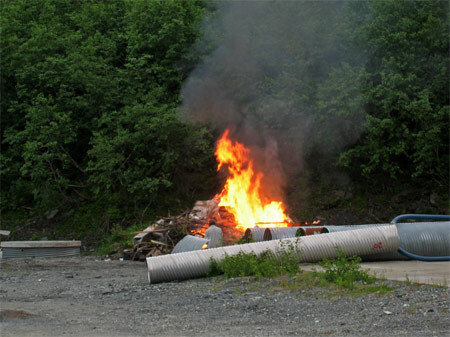 That's hard to do on a sunny day in June in Alaska. Even though I was far north the sunlight was pretty intense by nine in the morning and remains so until well into the evening. The sun seemed even more intense in Valdez. I don't know if that was because of the water, the mountains or what. I didn't get sunburnt but my eyes were hurting by the end of the day. My self-imposed deadline of ending the vacation photos on Saturday isn't looking very realistic right now. 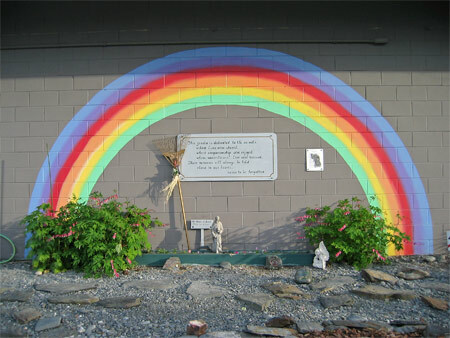 This little pet memorial garden is adjacent to a veterinarian's office in Valdez. 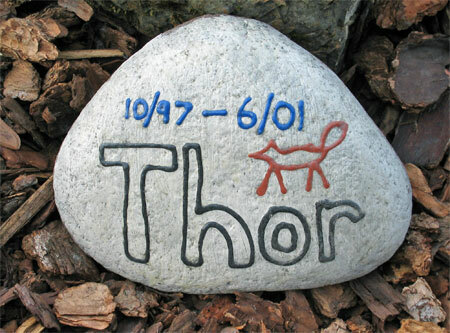 I don't think the pets are buried there, just memorialized. 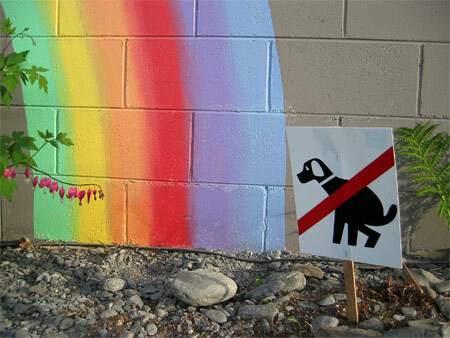 Feel free to leave any disrespectful comments about the pot of gold at the end of the rainbow in the comments.